A stride that is familiar around the world. 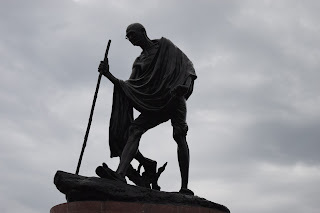 It is the 68th anniversary of his passing away, a "Martyrs' Day". I believe India has several of those - honouring the many who gave their lives to the cause of India's freedom. Part of the ceremonies on this day was to have the entire country pause for two minutes at 11 am, in memory of this man, and to the cause he served. I am not sure how many even remembered the significance of this date! Just outside the gate of the erstwhile Madras Mint - now the Government Press - is this shrine of sorts. The autorickshaw drivers from the stand nearby must be the ones taking care of it. Fresh flowers, an awning to keep the rain out... and maybe a box for collecting the donations. If you click on the picture you will see that the iconography covers Christian, Muslim and Hindu symbols. Such syncretism is much required in these times... maybe the clock under the awning could be synchronised as well! The rains have been quite patchy this year; cyclone Vardah was an anomaly, one that gave the city more wind than water. The threat of the city going dry within a few weeks, if not days, appears very real. There was a bit of cloud today, and promise of showers over the weekend. If that happens, it would be a Godsend. You might take a look at the Kapaleeswarar temple tank and wonder what the fuss is all about. If there is so much water here, the ground water levels must be pretty good - that sounds logical. But this tank has been nurtured carefully - in the early 2000s, when rainwater harvesting was made mandatory, the tank was re-done with a little bit of thought. The normally sandy bed of the tank was laid over with a foot-and-a-half of clayey soil, which has helped in retaining the water much better. If you click on the picture and blow it up, you will notice that the lower steps of the mandapam are bare. We can probably breath a bit easier when they get covered up with water! Imagine it is sometime in the first decade of the 20th century. You are in your newly acquired motor-car (let us say it is registered as MC-2), driving eastward on the Edward Elliot's Road, taking the left turn at the Marina (the name Kamarajar Salai is a few decades away) on your way to the Fort St George. On your right, the lovely Bay of Bengal bringing back memories of Palermo; on the left - well, there is not much to see on the left. On the turn is the house that was built many years ago by Col. Francis Capper - and now a hotel owned by a native, who calls it Capper's House; after that, a few more houses - Beach House, belonging to Justice S. Subramania Iyer, Pentland House, Stone House and Jeypore House - before you catch sight of the Chepauk Palace. Fast forward to the mid-1920s. You can still catch glimpses of those houses, but you are surprised to learn they are no longer residences. You are told that in 1914, the Government had taken over Capper's House to establish the city's first college for ladies - the Women's College - guided by the Founder-Principal Miss Dorothy de la Hey, admitting 37 ladies in its first batch which began in July 1914. Miss de la Hey, in the early days of her tenure (which lasted until 1936) ensured the college would have enough space for expansion by acquiring all the neighbouring houses - it would have helped that the college had taken on the name of Queen Mary in 1917. Fast forward to the first years of the 21st century. The State Government has declared that the Queen Mary's College is to be relocated, the buildings demolished, and a new Secretariat complex is to be built there. Mass protests from Chennai's citizens and alumni of the QMC ensure that the Government backtracks. Much later, the buildings are accorded heritage status - but not before most of them have been degraded so badly that they are unsafe for occupation. Capper's House had actually crumbled. The new building that came up to replace it was named Kalaingar Maligai, now shortened as Kalai Maligai. There was some attempt to have elements of the colonial bungalow replicated in the design of the new building, but I am sure the dome on that building was inspired by a Buddhist stupa rather than Queen Mary's tiara! Tomorrow is the 10th edition of the Chennai Bird Race. About 50 teams, of 4 members each, have registered for the race. The idea is to spend the whole day, from 6am to 6pm, birding in and around Chennai - the boundaries are not very sharply defined, but broadly, it stretches from Pulicat in the north to Vedanthangal in the south. It is not necessary to cover the entire stretch; you can choose to stick to just a couple of spots within the city as well. The main thing is to spot as many of the 260-odd bird species of Chennai as you can. The teams had to collect their log books today. The teams have to come in and sign up, pick up their log books, meet fellow birders and get into the excitement of tomorrow. What better place to do it than this restaurant - Spoonbill - on TTK Road. It helps that the person who runs this is a member of the MNS - and she will also be participating in the bird race tomorrow! Going east on Kutchery Road, you might be surprised by a pair of lions sitting atop gate posts. They may have appeared regal at some time, but now they are crowded out by overgrown peepul shrubs, to the extent that the name on the gate post is part obscured. If you get close, you can make out that the name of the manse is Farhat Bagh. The twin of this gate post carries the name of its owner: V. Ramadas. It also announces his qualifications: B.A., B.L. If that does not convince you, he has added his professional title: Vakil. That title broadly applies to any lawyer, but Vemavarapu Ramdas Pantulu was a specialist in realty and land rights. He also dabbled in politics, and was one of the featured speakers at the 'First Andhra Conference' in 1913. In the Second Conference the next year, the Farhat Bagh vakil seconded a resolution to carve out the Telugu-speaking areas of the Madras Presidency into a separate province. In that he foreshadowed the Madras Manade movement; he seems to have faded out of politics after that, but reappears as a leading light of the cooperative movement, holding office as President of Indian Co-operative Banks Association between 1927 and 1944. In 1935, he also became the Founding Editor of the Indian Cooperative Review. 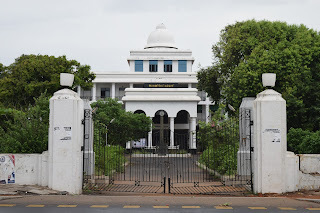 He had given over his library and a "...part of home in Mylapore..." to the Institute of Co-operative Research and Service to continue his work. Whether that home was Farhat Bagh, or some other, is a question I am unable to answer right now. There were no signs to indicate any cooperation happening there; but maybe it is just that I cannot recognize those signs! According to mythology, Lord Parasurama had to behead his mother on his father's command. Though she was brought back to life immediately after that, the severed head gave rise to the iconography of the representation of Shakti as Renuka. In keeping with that tradition, the temple of Renuka Parameshwari depicts the main deity as only the head. There is however, the full-bodied version as well, and also the icons of Kasi Visalakshi along with her consort. This temple does not go back very far in history; most accounts talk of it as being just a couple of centuries old. During that period, it has acquired a name that it is more commonly known by - Chinnakadai Mariamman - that I was surprised to find it has more formal name! Yes. That is truly how Kutchery Lane opens into the North Mada Street of the Kapaleeswarar Temple. But as one gets out from this narrowest of lanes, all it takes to get into the temple is to cross the street. That small gopuram is over a door to the temple's administrative office. That door does not open for you or me, it is quite possibly an entrance for only the most privileged of the temple's staff and/or devotees. For a long while, that was the entrance through with the temple's designated devadasi, would enter the temple. She was an integral part of the temple's rituals, and was accorded a high status in the temple's hierarchy. But over the years, the position of the devadasi was stigmatised, and there were likely enough people within the temple administration who were politicking to cut the devadasis down to size. 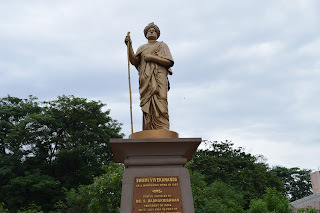 It was not just at this temple; all over the Madras Presidency and across India, the desire to abolish the devadasi system led to the passage of legislation such as the Madras Devadasis (Prevention of Dedication) Act in 1947. With that law in their hands, the puritan faction of the temple administrators walked out through the office door, into the Kutchery Lane, to the ex-officio residence of the last of Kapaleeswar devadasis and unceremoniously threw her out into the street. And so ended a tradition, one that gave much of today's Bharatanatyam dance, in obscurity and penury. Would it have been any different had the passage been much broader? It took almost two centuries for this "old-boys' club" to come up. The survey school that began in 1794 grew to become the College of Engineering, Guindy, of today. It was only in 1993, however, that some of the alumni decided that they needed a club that is both exclusive and global. Global, because the earliest alumni were not the natives, and also because over time, the native alumni have gone on to be stars around the world. Exclusive because it is meant for the alumni of the core colleges of the Anna University - the CoEG, of course, as also the Alagappa Chettiar College of Technology, Madras Institute of Technology and the School of Architecture and Planning. That may sound like a lot of institutions, but it must be remembered that the Anna University has over a hundred colleges under it. The Alumni Club - it does not have to specify what the alumni are of - has the facilities you would expect of any such club: meeting rooms, auditoria, restaurants, library, sports facilities. All of this spread out over a complex on the southern bank of the river Adyar, accessed only through the posh Boat Club area. But hey, an institution whose alumni have gone on to be social reformers, politicians (in India and other countries), cricketers, movie stars should get to do a bit of posh once in a while! The Hindu's "LitForLife 2017" kicked off today at the Sir Mutha Venkata Subba Rao Concert Hall. It was quite a full house today, with Dr. Shashi Tharoor on stage; after his session, a large chunk of the crowd followed him outside, to the author pavilion where he was signing copies of his latest book. On the way back after getting the autograph, spotted this book wall. Couldn't help thinking it would have been better with people - kids, especially - standing up close and reading these. And then, we saw that there were spaces at the Hall where you could sit down and read, and in fact, swap books for the day. That's nice - look forward to being back there tomorrow! Sometimes, when you get in early for a weekend movie at the Madras Race Club, you get a wide range of seating options. Although, with the way these tables are oriented vis-a-vis the screen, at least one person at each table must decide the movie is not worth watching. Maybe there is an opportunity here to design a movie-watching-on-club-lawn table! Like many other great personages, this man shed his mortal coils before he turned forty. Born this day in 1863, Vivekananda took "Hinduism" to the centre stage at the Parliament of the World's Religions in Chicago in 1893. It took Vivekananda nearly four years after that speech to return to his native land; he arrived at Colombo on January 15, 1897 and then, traversing the route from Pamban to Madras, arriving in the city on January 20. Though he lectured at Colombo and several other stops on the way, Madras was the focus of this return trip. The place that he stayed in was then known as Castle Kernan, or alternately the Ice House. It was not meant to be a residence, but then, it was spacious, on the Marina, and could accommodate the hundreds of visitors who wanted to meet this monk seemed to have strengthened their belief in themselves. The Madras Reception Committee said, in its welcome address, "...we come to offer you the love of our hearts and to give expression to our feeling of thankfulness for the services which you, by the grace of God, have been able to render to the great cause of Truth by proclaiming India's ancient and lofty religious ideals." So tumultuous was that reception that Vivekananda's words could not be heard by many of the nearly 10,000 strong crowd that attended. Their consolation was that they could look forward to a few more opportunities to listen to him over the next few days in their city. Vivekananda stayed in Madras for nine days. The enthusiasm which he generated was reason enough for an enterprising publisher from the city to put together a volume of his lectures. And somewhere in those lectures, he exhorted the young men of the city to build their strength, for a life of religiosity needed a strong body. He said, "First of all, our young men must be strong. Religion will come afterwards. Be strong, my young friends; that is my advice to you. You will be nearer to Heaven through football than through the study of the Gita." Wonder which of those approaches have gained popularity now! This must have been one of the original signs erected when a part of Madras was renamed Raja Annamalaipuram, after the passing away of the first Raja of Chettinad. That title was given to him by the British, in 1929, in addition to the knighthood that was awarded to him six years earlier. In gazette notification announcing his knighthood, he is addressed as "Diwan Bahadur Sathappa Chettiar Ramanathan Chettiar Muthiah Chettiar Annamalai Chettiar Avargal, Banker, Madras". Even de-duping the Chettiars in that leaves a lot of letters to be written; replacing the "Diwan Bahadur" with "Raja" helped, but even then, it would have been quite a task to find a board indicating the name of this locality had anyone insisted on the full title! Quick, who was the first woman sheriff of Madras? For all I know, she may have been the only woman sheriff of Chennai ever. That is Padma Vibhushan Mary Clubwala Jadhav, one of the city's most revered social workers and an early member of the Guild of Service, which is arguably the country's oldest voluntary service organization. She was born in Ooty in 1909 and died in Mumbai (then Bombay) in 1975. The years in between were mostly spent in Madras, where she became the moving spirit and the visible face of the Guild of Service. By the time of India's independence, the Guild of Service was an organisation of formidable repute: Rajendra Prasad, India's first President also became the Guild's Patron-in-Chief; over the years, that almost became an ex-officio position. As she tried to move social work from being "time-pass" into a structured, systematic activity. As much as the Guild opened up areas such as refugee rehabilitation, care for the destitute, foundling homes and such like, Mary Clubwala Jadhav also emphasised the need for a feeder system. That was how the Madras School of Social Work came to be established. Recognition came regularly; in 1935 she was appointed Honorary Presidency Magistrate for Madras, responsible for the Juvenile Court, a position that she held for the rest of her life, being re-appointed 15 times. In 1946, the Government of Madras nominated her to the Legislative Council, which they did again in 1952 and in 1954. In 1956, she was appointed the Sheriff of Madras, thereby becoming the first woman Sheriff of the city, to go with the honour of having been the first woman to be Honorary Presidency Magistrate. When she received that position, in 1935, she was but 26 years old. But that should not be surprising; though the Guild of Service was founded by Mrs Waller (the wife of Bishop Waller), it is said that Mary "joined hands with her" in starting it. The Guild dates its origin to 1923; it is unlikely that a 14-year old could be instrumental in its inception. Even so, given her dedication to the Guild, it is no wonder that she went on to receive the MBE from the British; the Padma Vibhushan came much later, in 1975, the same year that she passed away - still in service!